One of the most disconcerting ailments our patients present us with is chronic TMJ dysfunction. The constant clicking, popping, pain, deviation of bite, and general malaise caused by this syndrome is detrimental to some patients. 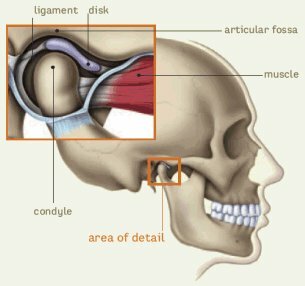 The temporomandibular joint is one of the most heavily used joints in the body. It is opened and closed every time you speak, chew, yawn, etc. thousands of times a day. In some patients, the arrangement of the protective covering over the head of the condyle (much like a slipped disc) can become dislocated, torn, eroded, or even shredded. The subsequent bony contact of the condylar head against the glenoid fossa (the bone of the skull where it articulates) can cause erosion of the bones, bone spurs, severe inflammation, dislocation of the jaws open or closed lock of the jaws, and severe unremitting pain. As always we try to treat TMJ disorder with conservative therapy. Happily, most of our patients respond to non-surgical treatment with only a small percentage requiring surgical intervention. If you are suffering from TMJ disorder, call our office for a consultation.